Art can be anything, and for one museum, whose main attraction is always art, it seems that they took this saying to the extreme. Because their newest and best attraction allows their visitors to invade the privacy of several apartment owners who lives just across the street from their building. Yes, it seems to Tate Modern, Voyeurism is art, and that includes peeping at children. 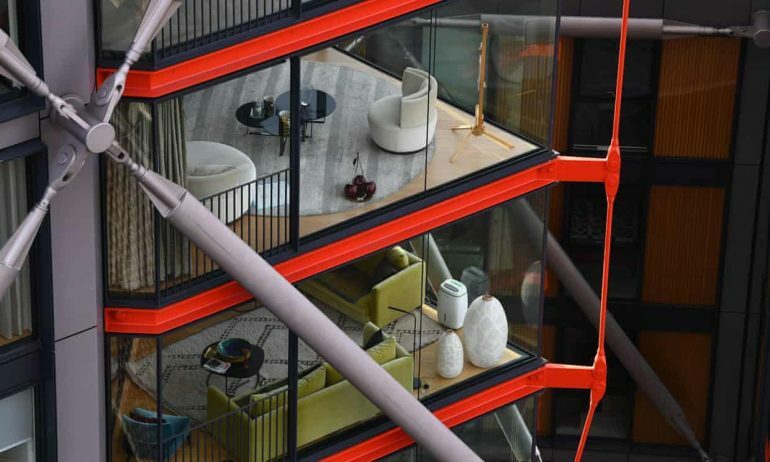 Our story begins in 2012, when NEO Bankside completed in 2012, just across the street from Tate Modern, in London, UK. Its a nice apartment, with each flat costing up to $4m. Of course, the apartment is occupied by mostly rich people. And so their lives remained undisturbed until around 2016 when Tate Museum built and completed a brand new extension of the museum in front of the apartment. So what was with the new extension that caused distress to the apartment owners? Well, it is because the new extension comes equipped with a viewing platform. A viewing platform that overlooks the apartment. If you remember the beginning of this article, you can guess where this is going. Now the apartment has a part where the corner portion of the floor can be seen. So each floor has this room and the whole room can be seen via the museum’s spanking new viewing platform. Soon the tenants noticed something odd: there are people on the viewing platform looking into their apartments. They tried to ignore this, but being turned into goldfish just a few days after the viewing platform opened to the public was too much to bear. The stares are quite aggravating, especially for one complainant, a resident of the apartment with two kids. “It’s really bad, because I have young girls and there are strangers looking in,” she said in an interview with the Guardian way back in 2016. She even counted that there were at least 50 people watching them from the museum’s extension. She brought blinds and kept them down, but that made the whole apartment gloomy in the process, according to her. The flat owners and the heads of Tate Modern tried to meet and talk about it, but they failed to get into any agreement. The flat owner’s wanted the viewing platform closed, or at least the part that overviews the apartment, but Tate Modern can’t since they argue that their viewing platform attracts a lot of people. Now one could argue that the only reason the viewing platform got popular is because word got around that you can peep into the apartment at the other side of the street. But that point seems largely ignored or was never thought of, and Tate held firmly the assumption that the visitors over there were aiming to look at art and not to peep into the apartments. Either way, it was raking them visits, And from a business perspective, even if it is harming people, you can’t just kill or let a cash cow go. And so the representatives of Tate Museum told the apartment owners to just put up curtains. The apartment tenants, of course, isn’t going to back out without a fight so they eventually sued the museum and launched a suit back in 2017. On November 2 of last year the case began the hearing in a High Court in London. The tenants’ testimony proved that the voyeurism has gone from bad to worse: one man’s picture was even posted on Instagram and was shared to hundreds of people. Tate’s lawyer fires back and told the tenants that they should just put up blinds and curtains. At this point, there should be no denying that the reason why the platform is highly visited is because of voyeurs trying to take a peek at the apartment across the street. But somehow, Tate Modern wins the case this February. An artist installs binoculars to encourage people to peep more. Mr Justice Mann, who was the judge of the case, ruled that it should be the responsibility of the flat owners to just install blinds and covers to obstruct the perverts and peeping toms and that it is the fault of the victims that they’re being peeped at. Of course, every one of the tenants was disappointed and is looking to appeal the case. In the end, the lives of the tenants will probably continue to be ruined unless they move out of the flats or ruin their own view, which would ruin the owner of the apartment building. But such is the case when you live near a museum that thinks that the best view in all of London is the privacy of other people. 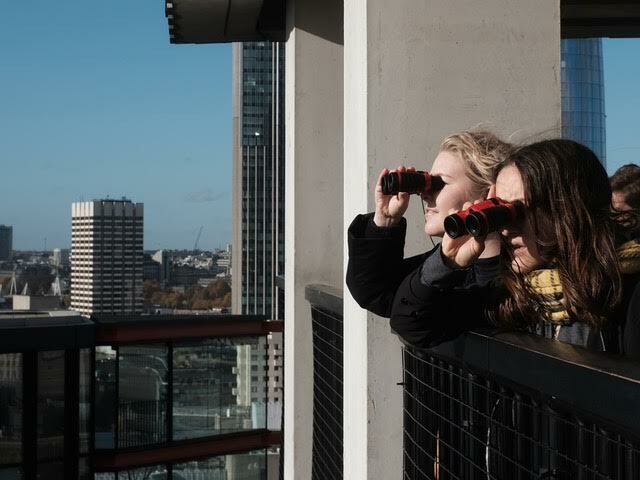 While it should be noted that they did put up a sign that tells people to respect their neighbour’s privacy, Tate Museum was never really serious about it, and even encouraged people to peep by allowing an artist to install binoculars facing the apartments. And that’s the story so far. 1st Image: The apartment in question. Via The Guardian. 2nd Image: The peeping toms, using binoculars that an artist installed. Via artnet.